from reading the flap content. But, then, I try to avoid apocalyptic tales, so I may not be able to spot one as easily as a fan would. This one has a really intriguing premise, though. Humans fall to the alien invaders because they destroy our economy. How cool is that? Adam, our main character, is an artist, and each chapter relates to a piece of art he's creating. In one chapter there's discussion of the artists of the Hudson River School and how their work is about atmosphere, clouds, mist, and moisture. Their work is "paintings of the air between things." I hope I remember that the next time I'm in a museum and stumble upon a Hudson School painting. Adam suffers from a bowel problem, a disease he picked up from drinking bad water in this dystopian world. Oddly enough, a character in The Lake Effect, another recent read, also suffers from a bowel problem. Yes, this is a meaningless coincidence. Though in both books the situation is presented as the life problem it is, not as an opportunity for toilet humor. So it may not be meaningless after all. At various points, I felt that this book was a serious downer. Which, of course, is the case with books about post-apocalyptic worlds. But the ending is on the positive, light side, making it different in my experience of the genre. 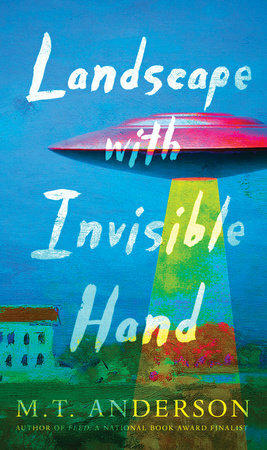 Landscape with Invisible Hand is short! That's how I want my apocalyptic novels.